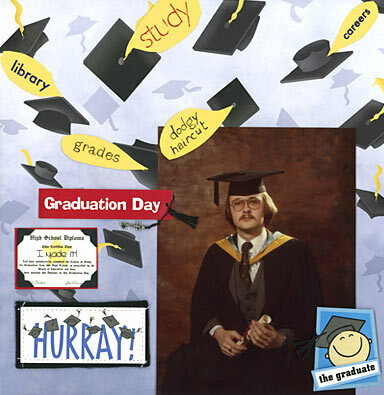 Have you also made a Graduation Scrapbook Layout from your least flattering photo?! At the bottom of this page is a Graduation Layout I made from possibly the world's worst snapshot of me! Now can you 'bite the bullet too?! Go on. It's really 'cleansing'. This graduation scrapbook layout represents quite a brave move on my part. Up until now this hideous photo of me has been kept firmly under wraps. What was I thinking?! There's a reason photos like this end up in the attic. It's not to save space, I can tell you! For this layout I wanted a busy background paper to try and deflect attention from the schmuck in the picture. I found the perfect 'Graduation paper' from Paper Pizazz. I liked the effect of a 'downpour' of academic expectation raining down on my totally fashion-resistant hairstyle. EMBELLISHMENT - AND I WASN'T EVEN WRITING AN ESSAY! I used to spend a lot of time changing my mind about how the final layout should look, which is why I find Jen Gormley's '500 Scrapbooking Sketches' such a useful tool. 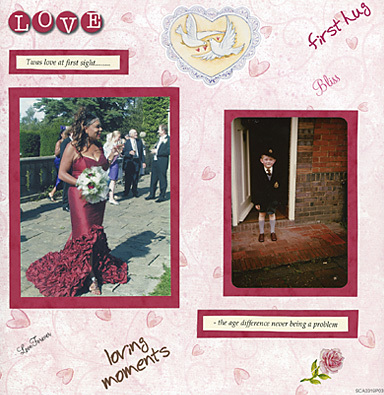 She's put a great example of what you can achieve with a sketch template on this page about half way down. This photo of me taken on my first day of school seems a natural moment to revisit, in a kind of 'circle of life' way. I think I was more stylish in this earlier shot. It went downhill very quickly after that!